I found these bracelets in a box while having a clearout... 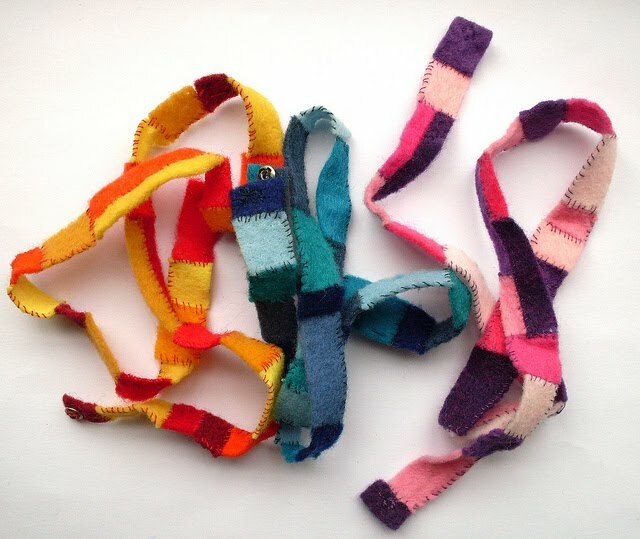 I made them when I was about 15, using colourful felt scraps I couldn't bear to throw away. They're super easy to make, and a great way to use up small pieces of felt. 1) Choose the colours for your bracelet - I used similar colours for each bracelet (e.g. blues for one, pinks and purples for another) but you can mix and match any colours you fancy, make a bright rainbow or perhaps choose colours to match the print of a favourite dress. 2) Cut the scraps into small squares and rectangles, all approximately the same width so you can join them up to make one long strip. If you don't mind fiddly cutting and sewing, you can cut two very narrow rectangles and sew them together with whip stitch to make one two-tone piece. 3) Arrange the pieces in the order you want. 4) Use whip stitch in a complementary thread colour to sew all the pieces together. Start by placing one piece on top of the other, lining them up at one end. Use whip stitch to sew along this edge, then stitch along the outside of one piece until you reach the opposite end. Then repeat this, so you keep adding new pieces and stitching along alternate sides of the bracelet (as seen in the photos) until you've added enough pieces to make the bracelet the length you need. I made my bracelets long enough to wrap around my wrist three times, overlapping by about 1-2 cm. You can measure this length before you start using a bit of yarn or string, or just test the bracelet as it grows. 5) Sew one half of a small snap fastener to one end of the bracelet, then wrap it round your wrist to see where to sew the matching half. 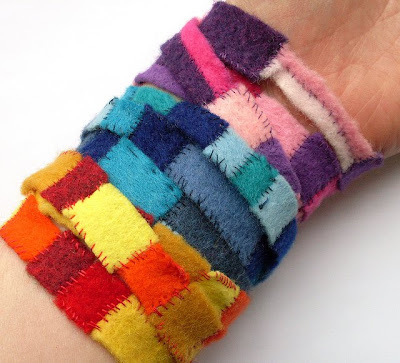 Remove the bracelet from your wrist and sew the second half in place. Please feel free to borrow photos if you want to blog about this project, but remember to credit me and link back to the original source, and do not reproduce my tutorial on your site. Thanks! Wow! Very cool recycling concept and so impressed you designed this when you were 15! It's great idea - they are so colourful! Thanks for sharing! Oh I love this! I always have felt scraps leftover and can't bear to throw them away. I wonder if this would also work well with other types of fabric? Thanks for the brilliant idea!! Thank you for sharing. Just found this and looks like something I would like to make. I absolutely LOVE bracelets. I'm a gypsy at heart!!! I CANNOT wait to try this! Thank you so much for sharing this with us!!! I just found this tutorial on Pinterest and I am smitten with it! Thanks so much for sharing this -- I can't WAIT to try it! This is very cute. 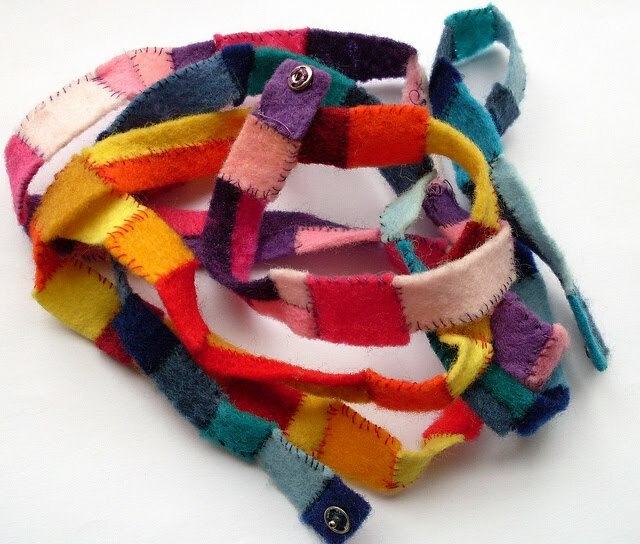 I have loads of felt scraps and will definitely make some! Gorgeous, I'm so pleased to have something to do with all those pesky left-over scraps. I added mini buttons to mine. You know those spares you get with your clothes...? Thanks for the idea.